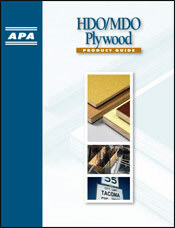 Special proprietary MDO Plyform is available for concrete forming. Regular MDO, or MDO – General, is intended for use as a paint surface and should not be used for concrete forming. Panels are typically overlaid on only one side, although they can be produced with MDO on both sides. 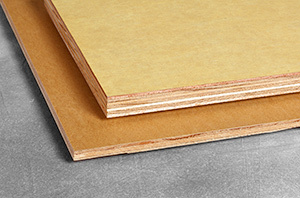 During plywood production, these overlays are bonded to the plywood under high heat and pressure in a press. The function of the overlay is to add stability, repel foreign substances from the surface and provide a smoother and more durable forming surface. The thermosetting phenolic resins used in overlay production are hard and resist moisture, chemicals and abrasion. MDO Plyform is normally factory-treated with a release agent and edge-sealed to protect the edges from water absorption. The abrasion-resistant surface should be treated with a release agent prior to its first use and between each pour to preserve the surface and facilitate easy stripping. MDO Plyform panels create a matte or flat finish on the concrete surface.